Home Why do we call the false self “false”? The spiritual psychology of Sufism is based on the distinction between the false self and the essential self. So why do we call the false self “false”? Recently I saw an interview between America’s most respected TV interviewer, Charlie Rose, and Dan Harris, a journalist for ABC News, and formerly a writer for the New York Times, who recently wrote a book called “10% Happier: How I Tamed the Voice in My Head, Reduced Stress Without Losing My Edge, and Found Self-Help That Actually Works — A True Story.” It’s a book about how meditating for 10 minutes a day can change your life. Initially he wanted to call this book “The Voice in My Head Is an A—–e.” However, that title was deemed inappropriate for a man whose day job requires him to abide by FCC decency standards. What surprised and even shocked me about this interview was the degree of psychological, spiritual unawareness it revealed. Harris, obviously a man of superior intelligence and education, was stunned when he first heard the idea that there is a voice inside of each person that carries on a boring and negative commentary on our lives, and that meditation could reveal this voice and reduce its power over us. Harris maintained that the simple practice of meditation could resolve a significant portion of human suffering, including the tendency to act on impulse, especially in negative ways. He also suggested that meditation was an antidote to the information overload we experience in the digital age. He described meditation as a refreshing experience. Well, perhaps you can sense why I found this whole conversation a surprise and even a shock. I don’t mean to criticize this book at all. In fact I could probably recommended it to certain people, but I was forced to revise my whole idea of how to communicate the essential ideas of Sufism, spirituality, and consciousness to a culture so unaware of basic psychological, spiritual, and metaphysical knowledge and distinctions. The practice of mindfulness, as valuable as it is, is a technique borrowed from the relatively comprehensive spiritual teaching of Buddhism, which also carries a highly developed ethical and metaphysical system. Sufism, I believe, incorporates some of the best features of Buddhist practice, while also incorporating many qualities that arise from a conscious and intentional relationship with the Source of Being, a field of infinite intelligence, nurturance, generosity and love. Mindfulness alone, as beautiful a practice as it is, can still be limited, confined to a concept of self separate from the Source of Being. While Sufism begins with awakening mindfulness (or presence, as we prefer to call it), it is also about the self’s relationship with the Source of Being. Through that relationship with greater Being we experience the essential self as infused with certain spiritual attributes that are sourced in the Divine. This is a methodology more than a belief system. Our ultimate destiny as human beings is to awaken these attributes, consciously reflecting more of these attributes or qualities in the circumstances of our everyday lives. The nature of the Real (al Haqq) is ultimately compassionate, nurturing, infinitely intelligent, generous, and beautiful. The human self is transformed through its relationship with Divine Being, which, of course, can only happen through our being awake and in harmony with the Divine. The false self is false because it is no more than a self-image created within our own minds. The ego, my limited sense of self, began as a survival mechanism, protecting me from the dangers of earthly existence. But gradually more and more was added to it. It builds an image of itself, whether rooted in vanity or low self-esteem, which must be defended at all costs. It is a mask that is worn with nothing behind it but the thoughts about my self-image and the emotions that affect that self-image either positively or negatively. Let us say that I think I am a graduate of such and such schools, a member of a certain religion (or not), a wife or husband, a parent, I work as a… All of my thoughts center around these main identifications and this defines the boundaries of my reality. I may add to that other stories and notions of myself as an especially good or important person (or not), as attractive or unattractive, etc. Whatever threatens this description of myself seems to threaten my very existence. The false self needs to be constantly defended because it has no more reality than mere opinion. The false self offers an immature strategy for attaining happiness through attempting to control circumstances, other peoples behavior and opinions, and, very likely, by lying to oneself. It is, however, a supremely ineffective strategy for attaining happiness because it is disconnected from the deeper levels of our self, and imprisons us in a superficial layer of the mind, precisely where the primary voice to be heard is the one so eloquently described by Dan Harris. The false self lacks self-awareness, and, therefore, authenticity. Even worse, the darker regions of the false self can shade into psychopathology and justify the pursuit of pleasure and power of the individual without any sense of moral accountability or human empathy. It is sobering to realize how much the prevailing mentality of our secular world is thoroughly conditioned by the desires, fears, and ambitions of the false self. Traditional Sufi wisdom teaches that we are the creation and manifestation of Infinite Love, and that every event and circumstance of our lives serves to awaken us and remind us that true happiness and security is to be found in the deepest center of ourselves where we are closest to that Infinite Love, where our true needs will be met. This is a long way from what was discussed on the Charlie Rose Show, but even the 10 minutes-a-day of secular meditation proposed by Mr. Harris is a step toward realizing a relationship with Divine Being. On the way of Mevlana, however, as with any authentic path, there is a deep and nuanced understanding and effective practice for awakening and developing our latent spiritual qualities and gradually learning to live from our most authentic and essential self. 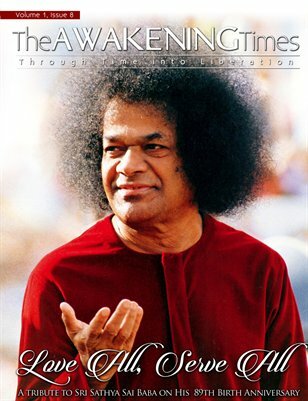 Sai Baba and MohanjiThe Awakening Times September 2015 Issue is out!